Since mixing water with electricity is a risky game, we encourage you to follow the rules when installing your bathroom lights. You should, of course, ensure that work is carried out by a qualified electrician, but it helps to have a basic understanding of the electrical standards beforehand. The best thing to do is to familiarise yourself with the current wiring regulations: Section 701 – Locations containing a bath or shower (18th Edition: 2018). These regulations apply to domestic settings and not emergency facilities, e.g. showers in laboratories or industrial areas. Basically, equipment is either in or outside of a zone. This is easily determined by measurement, as demonstrated in these diagrams. The height of zone 1 and zone 2 are limited either by the horizontal plane corresponding to the highest fixed shower head or water outlet, or the horizontal plane lying 2.25 m above the finished floor level, whichever is higher. 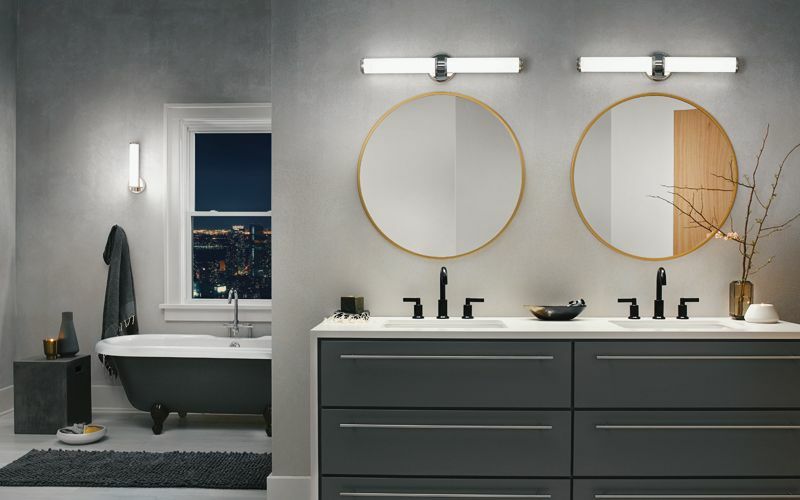 Since bathrooms are categorised by two zones (1 and 2), the type of light fitting you can install depends on where you wish to position it. You can easily refer to the diagrams to see which of these zones your fitting would be in. A residual current device (RCD) is a life-saving device designed to prevent you from getting an electric shock should you touch something live, e.g. bare wire. Regulation 701.411.3.3 introduced a new requirement that additional protection shall be provided for all circuits of the location by the use of one or more RCDs having the characteristics specified in Regulation 415.1.1. This means that all circuits, including lighting, electric showers, heated towel rails, etc. require RCD protection not exceeding 30 mA. 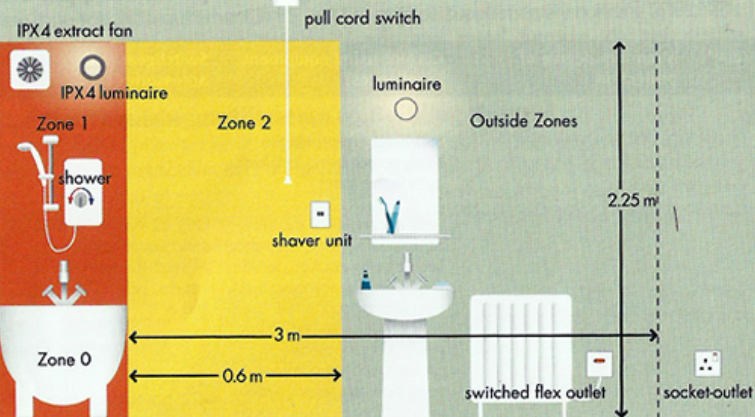 Regulation 701.512.3 permits 230 V socket outlets to be installed in a room containing a bath or shower, providing they are installed 3m horizontally from the boundary of zone 1. However, it’s worth noting that few people’s bathrooms actually have 3 metres of space from zone 1, so it’s rare that this would be the case. When you’re shopping for an electrical product, you may notice that its packaging is often labelled with an IP rating. Ingress protection measures how protected a product is against water, dust and how resistant it is to external impacts. The first number applies to dust and the second to water. For instance, a rating of IPX0 means that there is absolutely no protection against water, while an IPX7 rating offers protection from complete water submersion up to one metre deep for at least 30 minutes. The latest regulations state that any wiring system or equipment selected and installed must be suitable for its location and able to operate well and without deterioration during its working life. The presence of water can occur in several ways (e.g., splashing, steam/humidity, condensation) and at each location where it is expected to be present its effects must be considered and suitable protection must be provided. Consequently, Section 701 requires that electrical equipment in zones 1 and 2 shall have a degree of protection of at least IPX4. This means that you can install a 230 V light fitting above a shower or bath as long as they have a rating of at least IPX4, i.e. enclosed and water protected. If installed more than 0.6 m from the edge of a shower basin or bath (outside the zones) no special fitting is required but the luminaire must be of a suitable design for the conditions. Cord-operated switches are permitted in zones 1 and 2 of your bathroom. While it’s recommended that you install these to combat the occurring humidity and condensation, plate switches are also allowed provided they are installed in the outside zones. Again, this means that these switches need to be at least 0.6 m away from the bath or shower and must be suitable for the location. As always, check the IP ratings and confirm that the manufacturer’s instructions state the product is acceptable to use in the relevant zone before any installation takes place. If you need any more information, Section 701 of the Wiring Regulations is readily available to read online.